A fourth generation structural relocation company, founded in 1926. Experienced leadership, professional staff and modern day house moving and lifting equipment is exploited on each and every project. Every project we undertake is handled with the upmost precision and care, regardless of size and age. 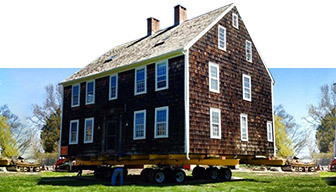 We offer every aspect of structural relocation and proudly serve all of Long Island. 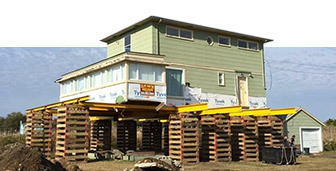 We are fully licensed and insured, and a member of the International Assosiation of Structural Movers! Contact UsToday!We are currently specializing in Super Storm Sandy lift projects. Contact the Dawn offices today and schedule an on-site appointment! “In 1992, our first and only home was flooded by a nor’easter just months after moving in. We were determined to save the house and not have it happen again. Several contractors were solicited and we selected Dawn House Movers. It would prove to be one of the best decisions we ever madegod. What was described as a difficult, complex (and scary to us) undertaking by others, was described to us by Stan as something he does everyday. Sure enough with confidence and real action, Stan and his crew had our house up in the air in no time. We have been working on it for the past 20 years and hurricane Sandy was a true acid test for us. Our house came thru with no flooding or damage. What was once the home that always got flooded is now the home that doesn’t get flooded. We could never, ever had made it to the point we are at without the help of Dawn House Movers and Stan.